Welcome warm weather with this Spring Pea Pasta with Lemon and Mint. 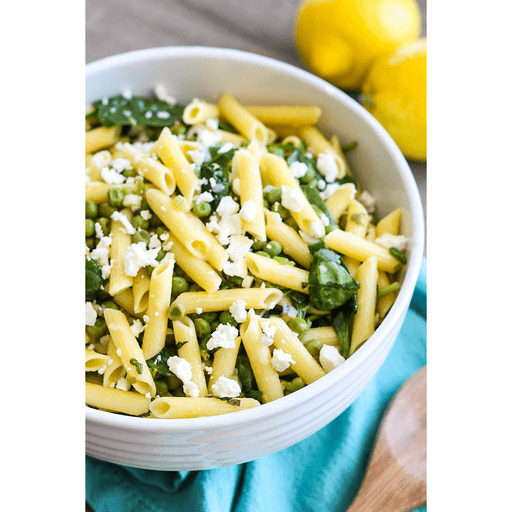 Filled with fresh flavors like lemon zest, mint, spinach and green onions, this pasta salad is great as a refreshing side dish or plant-based meal. 1. Cook pasta according to package directions 1. During the last minute of cooking, add the peas to the pasta to just lightly blanch. Drain and place pasta and peas in a large bowl. Drizzle with olive oil and lemon juice. 1. Stir in lemon zest, spinach, green onions, minced shallot and mint. 1. Season with salt and pepper. Top with goat cheese and serve. For gluten free: Use gluten free pasta. For dairy free: Omit goat cheese. Calories 360, Total Fat 15g (Saturated 2g, Trans 0g), Cholesterol 0mg, Sodium 320mg, Total Carbohydrate 50g (Dietary Fiber 9g, Sugars 6g), Protein 13g, Vitamin A 40%, Vitamin C 35%, Calcium 6%, Iron 20% *Nutritional values are an approximation. Actual nutritional values may vary due to preparation techniques, variations related to suppliers, regional and seasonal differences, or rounding.